Meridia, the Lady of Infinite Energies, is a Daedric Prince and an enemy of Molag Bal. As such, she has made it her mission to prevent the Planemeld. 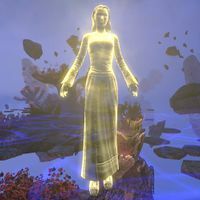 A number of her crystals, called the "Lights of Meridia", can be found around Coldharbour and possess great power, and her own realm of Oblivion is the Colored Rooms. The Hollow City, found in the center of Coldharbour, is under the protection of Meridia. She is initially disguised as The Groundskeeper, the mysterious caretaker of the Hollow City, but soon reveals her true nature after arriving in the Planar Vortex. Her mortal servants are that of King Laloriaran Dynar, the last surviving Ayleid; Guildmaster Sees-All-Colors, the initial leader of the Fighters Guild; and later Cadwell, the oldest known Soul Shriven. 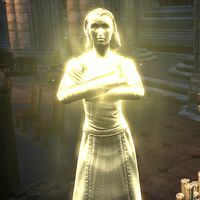 Among all her servants, her vessel is the Golden Knight, her "will and power" that she sends to spread her light and banish the darkness threatening Nirn. Following Darien's sacrifice, he was transported back to the Colored Rooms and wrote a final letter, warning that Meridia is a deceiver and is not to be trusted. Her involvement in the Depths of Malatar reveals a much darker side of her nature, where she entrusted King Narilmor with one half of the Wrathstone until the time came where she could use it. She is said to despise free will, purifying many mortals and daedra into Lustrants, immortal beings purely under her control. "The Dark Prince will need stronger chains than that to stop me." After the Groundskeeper approaches the Dark Anchor, she will then rise into the air and glow, shedding her physical form. Meridia: "My power is greater in this between this place." 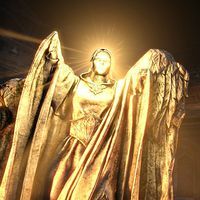 A beam of golden light will then destroy the Anchor and Meridia will then call you over. Meridia: "The Dark Prince will need stronger chains than that to stop me. Come, we have things to discuss." She will be amused at your reaction. "You seem surprised, mortal. Did you not suspect my true identity?" Why did you pretend to be the Groundskeeper? "I did not pretend, mortal. I am the Groundskeeper. I merely hid the fact that I am also a Daedric Prince. My plans have been long in the making. Had I revealed myself too soon, I could have jeopardized everything." Why does the great Meridia need my help? "Do not presume to question my motives! Suffice it to say, I required mortal assistance to destroy the vortex and halt the Planemeld." Is this just a game to you? "Reality is a game, mortal. Learn to play, or resign yourself to becoming one of the pieces that is meant to be sacrificed. Your allies have arrived. Speak to them before we continue." I'll do whatever's necessary to save my world. "You mortals only see life as precious because it ends. Take it from a god—you'll never know how fortunate you are. Meridia will give a chance to talk to your allies who have recently emerged from the portal. Once you feel you are done, speak with Meridia to learn more about her plan. "Speak to your friends, for these moments may be their last. But do not tarry too long. Time is fleeting, and each moment is a thief that steals far more than it brings." "The Lord of Brutality uses Dark Anchors to bind this vortex. We must destroy all three before the power of Meridia's Light is unleashed, otherwise the resulting backlash could destroy Nirn as surely as the Planemeld would." What happens once we destroy the last anchor? "Meridia's Light must be unleashed at the focal point of the vortex. We will need to locate that focal point." "Again, I remind you that this will be your last opportunity to speak to your allies before the final battle begins. When you are ready, let me know." "So, it begins! Destroy the remaining anchors. I shall begin searching for the focal point of the vortex." "The chains bind both planes. We cannot use the light until those chains are destroyed. Go quickly!" Meridia: "We have to hurry! Molag Bal knows we're here!" Molag Bal: "I grow weary of your games, Meridia." Meridia: "Go, Warriors of Light! These dark chains must be broken!" Molag Bal: "You cannot stop me, Meridia. This realm will be mine!" After you place the Light of Meridia, your allies will be teleported away, and Molag Bal will mock you until you slay his council. Molag Bal: "Most curious, this light powers you somehow. Meridia … where are you hiding?" Meridia: "Merely fetching those who would stand against you." Molag Bal: "I tire of this game. Now you shall die!" Meridia: "Quickly, get behind my shield!" Molag Bal: "Did you think it would be that easy? My minions will tear you apart." Meridia casts a shield around the Light while Vanus Galerion and Gabrielle Benele perform a ritual on it. While this is happening, you, King Dynar, and Darien Gautier fend off the Daedric hordes. Eventually the spell will be near completion. Meridia: "You must hurry! My shield can't withstand much more of this!" Vanus Galerion: "Almost … there! Gabrielle Benele: "I can feel it, Vanus! We can beat this! We can—Darien, behind you!" Darien Gautier: "Have no fear, beautiful Gabrielle! I have this under control!" King Laloriaran Dynar: "You have to hurry! We can't hold them back much longer." Meridia: "The light is ready! Quickly, release it!" Molag Bal: "No! You cannot do this! I cannot fail!" Gabrielle Benele: "Darien! Get back here! Darien!" In a bright flash of white light, you will be transported back to the Hollow City and wake up in the Chapel of Light. Meridia will be waiting beside you. "The planar vortex is destroyed. Molag Bal's Planemeld is at an end." "You are mortal. You began to die the moment you were born. You are not fully dead. Not yet. Your song has only just begun, and many verses still lay before you." "The vortex has been destroyed. I designed this place to be familiar and calming to you. It is a small pocket of Oblivion, under my protection. No harm will come to you here." "Those present when you shattered the light were under my protection. They gather in the room beneath us, saying their farewells. Those who were not a part of the final battle? I cannot say." "The Ayleid King suffered grievous wounds. He is near death, but he has not passed yet." What did you mean, only just begun? "Do you not see how singular you are? How remarkable? You entered the realm of a Daedric Prince, gathered an army strong enough to fight his legions, and saved your mortal world. You are a valuable asset, mortal. You will be of great use to us." "For the nonce, we require nothing. But, the Dark Princes have taken notice of you, and they have plans, and plans within plans. Prepare yourself, and be ready when Oblivion calls." Meridia: "Come forward, Vestige. You are safe, for now. Something precious has been riven from Stone-Fire's being. I have brought it here for you to reclaim." Molag Bal: "I congratulate you, little insect. Your sting is formidable. You have bested me and released a thousand times a thousand souls back into the Mundus. For the moment, your world is spared, but my grand scheme has only begun to unfold. Excellent. Your power shall prove useful in the coming conflicts. The dark machinations of Oblivion are far more complex than anything your mortal senses can comprehend. You've made a great and terrible enemy this day. Your world would have been better off if the Planemeld had succeeded. Had you bowed before me and accepted eternal servitude, I would have protected you. There are worse masters than I. Far worse." Meridia: "You are but a phantom here in my domain, Stone-Fire. The mortal prophecies of the Scrolls have been fulfilled. Leave this place and return to your pit!" "Your soul is restored. I can see its light within you. And you have saved your world from a great calamity. But know this, mortal. The forces of Oblivion are legion, and the God of Schemes is but a single player in a complex battle for supremacy." What happened to Molag Bal? "You have wounded him gravely. It will be some time before his power is restored." Where is the Amulet of Kings? "As your enemy fell, the one you call Abnur Tharn took Chim-el Adabal and fled. He returns to the land from whence he came, the place you call Cyrodiil." He took the Amulet with him? "The Amulet's power has been expended for a generation or more. The Imperial will not be able to use it, nor will he profit from it, though he will spend many frustrated years in the attempt." Did we succeed? Is Tamriel safe? "The tear in the veil between Oblivion and Nirn has been repaired. Your world is safe, for now." What of my lost companion? "Gone forever, but their memory remains. I can see the light burning brightly behind your eyes. Your friend is a part of you now, just as the strength of the Divines burns like a flame within your renewed soul." "Your story has only begun. Molag Bal still has plans for you. In many ways, these events played out to his advantage. And you have attracted the attention of the other Daedric Princes, as well." "The war between mortal kingdoms is still ravaging your world, but your true enemies are not mortal. If you are to be prepared for the coming conflicts, you must fully comprehend what is at stake. You must live among those you make war upon." "Indeed. When you return to Tamriel, go to the place you call the Harborage. My gift awaits you there. It will allow you to travel to other lands and hide your true nature from those who would see you as a foe." Can you send me there? "I have no more desire to keep you here than you had to remain in Coldharbour. I shall return you to your little den in the wild. Your surviving companions await you there. Are you prepared to leave?" Sadara-do: "Oh, master! What did those bastards do to you?" Sadara-do: "Look what they did to his body. They defiled Meridia's shrine!" Razum-dar: "That light … that is not natural, yes?" Sadara-do: "Meridia, she calls to us!" Meridia: "My devoted priest, a loyal soldier, and an intrepid instigator … step closer and bask in Meridia's light!" Razum-dar: "Why is the statue talking to Raz? Should it be doing such a thing?" ""My followers murdered. My shrine desecrated. The other Princes, this so-called triad, they must answer for these insults. But I sense a question in your mind. Speak, mortal! Ask what you will of the Prince of Light!" "My followers murdered. My shrine desecrated. The other Princes, this so-called triad, they must answer for these insults. But I sense a question in your mind. Speak, Champion of Coldharbour! Ask what you will of the Prince of the Light!" Your Golden Knight was captured and his sword damaged. We seek your guidance on how to repair it. "They dare to steal my vessel? To hold prisoner the agent I put in place to foil their despicable plans? My light shall not be snuffed out! My Colored Rooms will not be compromised! You must set Darien Gautier free!" "My vessel thinks of itself as Darien Gautier, a simple Breton warrior, but in reality, it is my will and my power. When a darkness enters your reality, I send Darien to banish it. You must enter Mephala's realm and rescue Darien, the Golden Knight." "My vessel just thinks of itself as the mortal Darien Gautier. In reality, Darien is my will and power, inserted into your reality whenever my light needs to banish the darkness. I will admit my knight changed after it met you, though." What do you mean, Darien changed? "The knight had a single purpose, but somehow you complicated matters. Now the knight actually… cares. You and my vessel will both be required to stop the triad. You must enter Mephala's realm and rescue Darien." I retrieved the Dawnstar gem. Can it be used to reforge Dawnbreaker? or What about the Dawnbreaker? Can it be repaired? "The gem cannot grow a new sword, but I can add to its power. Now you can use it to locate Darien in Mephala's realm. Return to the Ritemaster and tell him what I said. Wait. How dare they! The triad dares to invade my sacred realm? This cannot stand!" 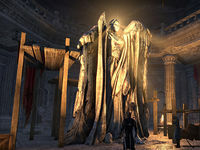 The player tries in vain to ask Meridia what's wrong as her statue begins to bleed purple blood from the eyes, and the conversation is cut short. Sadara-do falls to her knees before the statue and weeps. Sadara-do: "Meridia, my Prince! She's gone! I can't feel her presence any longer!" Razum-dar: "Raz is certain that the nice statue will be fine. In the meantime, let this one take you someplace where you will be safe." Meridia's traditional Daedric soldiers are the Aurorans, who are soldiers masked with golden armor. Initially, the only one that appears in the game is the Auroran Battlemage, which used the Golden Saint model. The Lightless Oubliette book also mentions Auroran prisoners being present in the eponymous tower, but none appear. If you speak to Varen Aquilarios in Scarp Keep after completing the Main Quest, he will call you by a number of titles including "Meridia's Champion". This page was last modified on 9 February 2019, at 21:31.